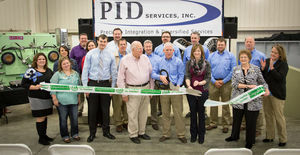 ￼￼￼PID Services Inc. cuts ribbon on expansion project - PID Services, Inc. PID Services, Inc.
A Lufkin manufacturing company celebrated the completion of an expansion project on Friday. 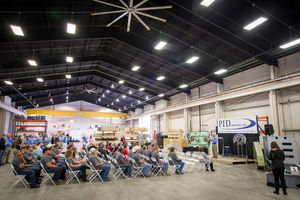 Employees at PID Services cut the ribbon on its composite shop expansion project, adding an additional 3,600 square feet for a total of 10,800 square feet dedicated to composite processing. With the completion of this expansion, the company now maintains more than 50,000 square feet of manufacturing space. The manufacturing of composite products is a multibillion dollar business worldwide with products ranging from sporting equipment to automotive and aerospace parts, according to Slusher. The aircraft and automotive industries have long been challenged with making their vehicles lighter, stronger and safer, and a way to do that is to move away from metal and into composite materials, Slusher said. 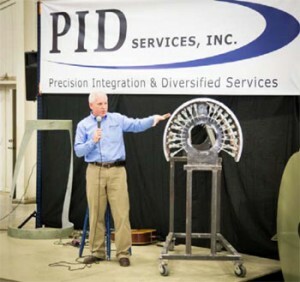 Since it was established in Lufkin in 2001 as a controls and instrumentation company, PID has expanded its services to include metal fabrication, machining, crating, electrical panels and composites. The company manufactures tooling for the Bell 525 relentless helicopter, the India Aeronautical Development Agency Tejas LSP-8 jet fighter and the Boeing 737 radome. While aerospace will be PID Services’ primary focus with composites, the company also will work with the automotive and wind generation industries. At the end of 2012, PID Services was granted tax abatements by the city of Lufkin, Angelina County and Angelina College requiring a minimum capital investment of $1.4 million and adding 12 additional jobs by the end of 2016 for a total of 47 employees. Slusher said the company has invested more than $2.8 million in facilities and capital equipment and employs more than 60 people. Scott Slusher, president and CEO of Precision Integration & Diversified Services Inc., talks about the parts produced by the Lufkin business, which employs more than 60 people at its facility on Southpark Drive.